TSCSF Coverage of Men's Olympic Hockey: USA vs Canada for "All the Marbles!" 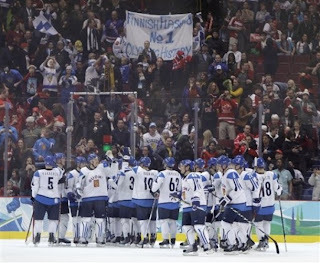 Yesterday, Finland and Slovakia played with the Bronze medal on the line. It was a pretty even start with Slovakia quickly catching onto Finland and scoring goals leaving them on top until the third period in which the Finns pulled out strong to finally earn the Bronze!! My predictions were Russia (Gold), Canada (Silver), Sweden (Bronze) ... I KNOW, don't even start on me (I didn't even expect the USA to medal, but that was only because I was taking into account the youth and inexperience of most of the players, so HUSH!)!! I'm hoping that I can redeem myself somewhat by Canada losing against the USA and their getting the silver (and USA coming out on top). Anyway, both Russia and Sweden were eliminated quicker than [I had / a lot of people] expected and only lasted up until the elimination round. Regardless of the outcome, this will be a pretty exciting game and one that I'm anxious to watch (neither team has anything to be asshamed of as they both did quite well throughout the tournament). And for those of you who believe that USA will defeat Canada with no problem simply because of the result of the last time these two played ... I say to you, that means nothing and they both are starting from square one today (Canada definitely got a wake-up call and they'll be better prepared for Team USA today ... mark my words!)!! As an extremely touching tribute during today's game, Team USA will be honoring soldiers wounded in battle in either Iraq or Afghanistan for the Gold-Medal game. In a program they've called "Operation Homefront," all 23 players making up the team will be playing for an individual soldier. Penguins own defenseman, Brooks Orpik, has been teamed up with Pittsburgh native Staff Sergeant Shawn Barber (CLICK HERE TO READ THE ENTIRE ARTICLE). Another interesting sidenote of today's game, not only will Team Canada be playing to earn the Gold, but they will also be playing to put their country in the Olympic record books as Canada currently has a total of 13 which has them tied for the most (Gold medals) for a nation in the Olympics. And not that Americans really need pumped-up for this game, but here's a little something to get your blood pumping!!! ENJOY!!! I will admit I didn't expect USA to get to the Gold Medal round but I am super excited that they are here!! I thought it was going to be a match-up between the Canadians and the Russians. I am definitely pulling for USA and I hope they can win but if they don't well they Crosby gets an Olympic Gold Medal to go with his Stanley Cup ring. GO USA!!! !